Publication Notice: This issue of The Remnant is dated September 25, 2015, and is currently in the mail. You can read the new issue online right away by subscribing to THE REMNANT E-EDITION. 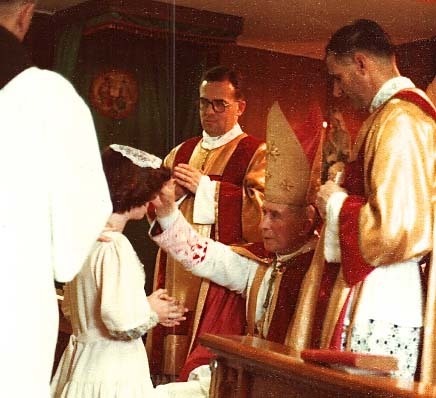 This is a photo of Kamela Gleason in 1978 receiving confirmation from the late, great Archbishop Marcel Lefebvre back in the days when the old-rite Confirmation had nearly disappeared from the face of the earth. The new-rite Confirmation was so appalling that many parents worried it was not even valid. Imagine, then, what a visit from the French Archbishop meant to us all back in those days! Kamela is a Remnant subscriber and an old friend, and we're very grateful to her for sharing this touching and meaningful photograph with us. Michael J. Matt From the Editor’s Desk… A Visit to the Top of the World. A frank discussion of a recent visit to Menzingen, the SSPX’s canonical status, and whether or not now is a good time for the Society to be regularized. Chris Ferrara Vandals In Rome Francis to Sack Christian Marriage? Neo-Catholics Beware: This one is not for the faint of heart. Hilary White Dig Up the Bar: A Word on Pro-Life Feminism. Uh-oh, there goes yet another sacred cow. Patrick Archbold Bracing for the Synod… Means, Motive, and Opportunity. Is Francis responsible for what will happen at the Synod, or not? Orlavo de CarvalhoLiberation Theology Survives Discredit and is Alive and Well... Under the Command of a Corpse. If you want to understand Francis you MUST read this article, though it includes not a single reference to him. The Remnant Speaks Letters to the Editor this week include one from a prisoner trying to gain access to the Latin Mass.